Of course the box for this game was the first thing to catch my attention. I’m generally a fan of games with a little more strategy and complexity than simple dice rollers, but, as I’ve mentioned before, every now and then I want something that I can just pick up and play without much preparation time and without too much thinking. Dungeon Roll is a perfect game for those times. My main filler game has been Zombie Dice, by Steve Jackson Games. Zombie Dice is a quick, easy to learn press-your-luck game and is a lot of fun to play with a group. I also recently purchased Cthulhu Dice, which I reviewed here, which is also a quick press-your-luck game. Dungeon Roll fits into that same category, but with some different twists and a little (not a lot) more depth. 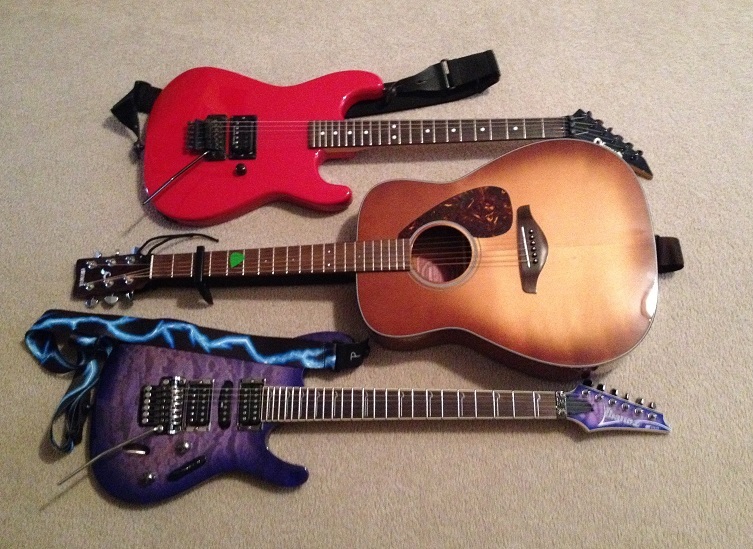 The most obvious difference is that Dungeon Roll has a dungeon/fantasy theme. But Dungeon Roll adds some cool elements in the way of treasure tokens, experience points, character cards, and dragon fighting. 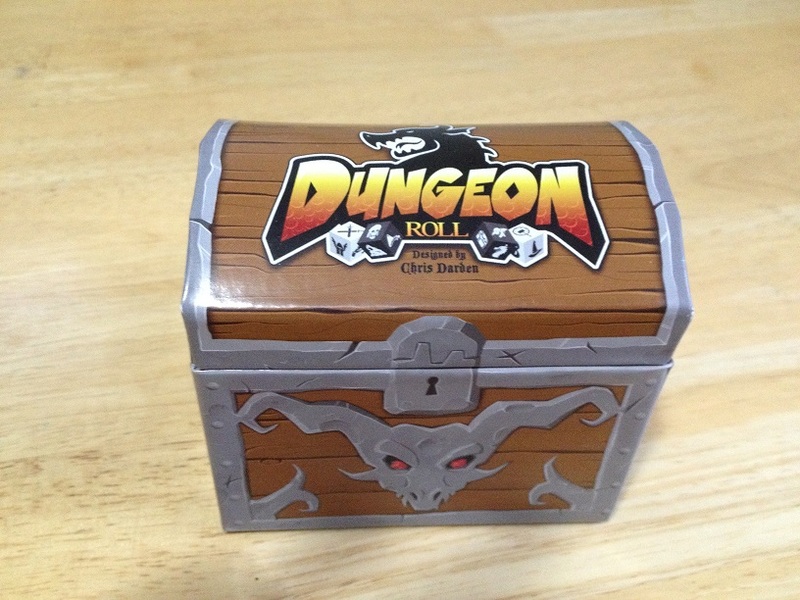 Dungeon Roll is played by first rolling 7 white “party dice” to create a party of adventurers. Party dice consist of 6 sided dice with fighters, clerics, mages, thieves, champions and scrolls. 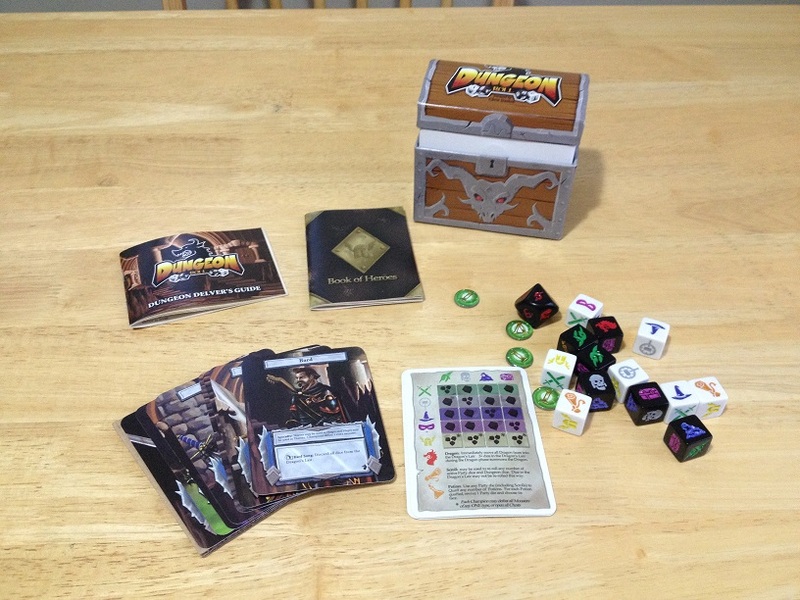 Once the party is randomly created by rolling all 7 dice, black “dungeon dice” are rolled to represent monsters, potions, treasure chests, and dragons. The basic mechanic of the game is that certain types of dice “defeat” or cancel out other types of dice. This is done by removing both the party dice and the dungeon dice that fought and then seeing what remains. For instance, each adventurer dice face can defeat a monster dice face. The strategy comes from certain adventurers being more adept at fighting certain monster types. A fighter can kill all goblin dungeon dice rolled, a cleric can kill all skeletons rolled, and a mage can kill all oozes rolled. The champion can kill any amount of a single type of monster. In addition, any adventurer can open a single treasure chest, but a thief or a champion can open all treasure chests rolled. You also draw a character card that will give you a couple of special powers during your delves. On occasion, depending on how many dragons you’ve rolled, you have to defeat a dragon by combining three different types of adventures, if you have enough left by then. You get three delves into the dungeon and you gain experience points based on how many levels you can get into the dungeon on each delve. The deeper you go into the dungeon, the more experience you collect, but if you ever get to a point where you don’t have enough adventurers to fight the monsters on a given level, you lose all of the experience points for that delve. The instruction manual can be a little confusing, but all of the information that you need to play is there, it’s just not laid out in a way that makes it easy to understand at first. I was confused on the first read-through because some things in the beginning of the manual didn’t make sense until I had real the latter parts. I found that reading through the manual twice, trying a quick solo game, and then re-reading the manual was the best way to get a good understanding of the rules. Sometimes having a single game completed can go a long way to helping you know what to look for in the instructions to clear things up. The instructions include a URL to a video that explains the game very well, so clearer directions are referred to in the manual at least. Game play for us so far has lasted between 15 and 30 minutes depending on how many players we have. 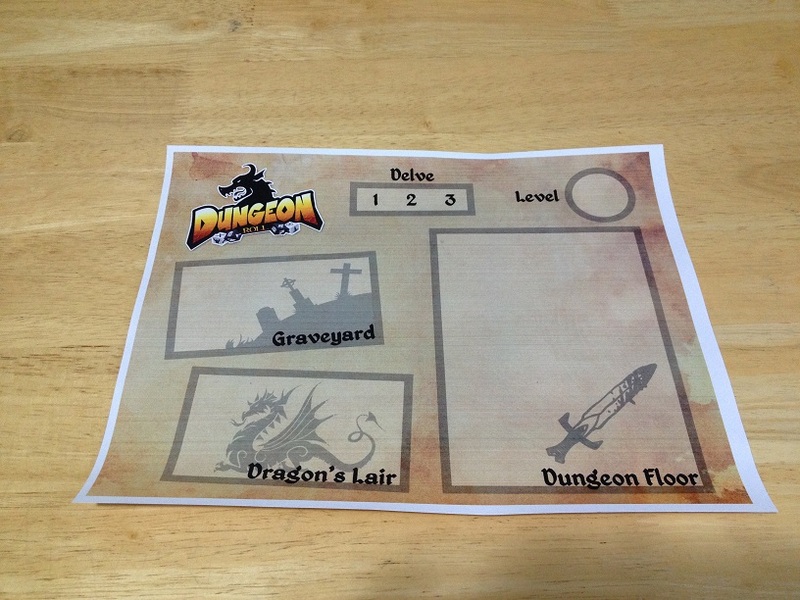 One thing that has added to our enjoyment was to print out some of the fan made play mats that are available at boardgamegeek.com. A play mat isn’t necessary, but one that has a nice theme and artwork can add a little atmosphere while giving you well defined areas for placing the dice as they are used throughout the game. I actually took the image shown on the paper below and had it printed on a glasses cleaning cloth (thanks for the suggestion Boardgame Geek users!) so it can be folded up and kept in the case. Overall, a great little game, especially if you happen to catch it on sale like I did.